Bearings are an important part of the caster and there are several different sizes and styles to choose from. Based on the use of your cart or equipment, this will determine the bearing best suited for you. The roller bearing is by far the most commonly used and the most economical, this bearing is very durable and can handle heavy loads and still roll easily. These bearings need to be greased on occasion. Precision Sealed bearings are maintenance free and an upgrade from the the roller with a smoother action and completely sealed from dirt and water. These bearings are limited to certain wheels and do not work with a top or face brake. 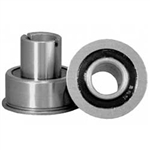 Delrin bearings are used mainly with stainless steel and are simply a sleeve that is impervious to water and chemicals. The Tapered bearing is the top of the line and used in extreme load applications and tow lines due to the fact that they can withstand extreme side thrusts and higher speeds.